We’re a 10 minute walk – or £4 taxi ride – to the old town, an historic and architecturally-rich area full of independent shops, bars, bistros and restaurants. We’re more than happy to recommend great local eateries to suit all budgets and tastes. 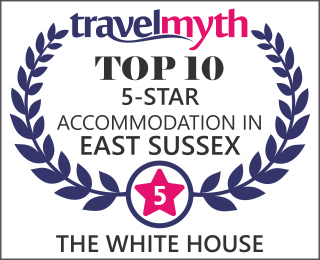 There’s plenty more to explore within easy walking distance of The White House including Hastings castle, the fishing huts, several museums, the 850-acre country park, The Jerwood Art Gallery and the beach. Within a short car journey nearby attractions include Rye, Battle for the Abbey and 1066 Battlefield, Bodium Castle, Camber Sands beach, vineyards in Sedlescombe, The De La Warr Pavillion in Bexhill, Eastbourne and Beachy Head, fabulous country pubs, farm shops and walks, the opera at Glyndebourne and The South Downs to name but a few.